St. Thomas is the sophisticated U.S. Virgin Island with a booming villa rental and real estate market, plus lots of action, attractions and activities. You won't be bored for a moment. McLaughlin Anderson Luxury Villas, the premier Caribbean property management company in this part of the Caribbean, offers a large selection of luxury St. Thomas villas, from small romantic cottages, to large and impressive island estates... to The Ritz-Carlton Club Residences and Suites, superb accommodations with legendary service set directly on one of the best white-sand beaches on St. Thomas. St. Thomas has a good number of cosmopolitan five-star restaurants, many of them open to tropical breezes and the view. But don't forget to sample the native cuisine - fresh local fish and dishes like crab and rice and kallaloo. Spend your days at any one of our many palm-fringed beaches, rising from your beach chair or towel only to paddle about in the azure sea. Use a mask and snorkel to spy on the exotic undersea world that surrounds St. Thomas. Or don a SCUBA tank for an adventure down into the deep. Sail or windsurf to any of the offshore cays that dot the horizon, or practice your putt at our seaside Mahogany Run Golf Course. Our luxury villas are outside of the downtown area in lush and private neighborhoods, giving you the best of both worlds! You may choose to emerge from your villa to roam the narrow streets and alleys of historic Charlotte Amalie, a small and sophisticated Caribbean capital which since the 1600's has enjoyed her share of island travelers. Take a few minutes from your search for that perfect piece of duty-free jewelry or original island art to absorb a bit of the island's history. The old stone buildings that now house an almost unimaginable array of merchandise once served to store the necessities of a plantation economy. Camille Pissarro, born above one of the Main Street stores, left a legacy found in the plethora of Caribbean art for sale here. Trek up the 99 Steps to Blackbeard's Hill where you will find Crown House, now a private residence, but when Denmark ruled the Virgin Islands, the home of several governors. Directly above are Blackbeard's Castle, built by the pirate Edward Teach, and the old Lutheran parsonage. Very few villas are located on their own beaches (all beaches in the U.S. Virgin Islands are public), but St. Thomas is a small Caribbean island, only 4 by 14 miles, and it will only take you a few minutes to drive to any of our many and varied white sand beaches - what the Virgin Islands are famous for! You may even walk to the beach from some villas. On St. Thomas, many of our villas are ON the water, but are set on cliffs overlooking the ocean and cannot truly be called "beachfront". They all have captivating ocean views - the U.S. Virgin Islands are also known for their incredible sea vistas, especially St. Thomas's sparkling harbor and town, and its incomparable "down-island" views of St. John and the myriad British Virgin Islands beyond. You'll be dazzled! BRING PROOF of YOUR CITIZENSHIP Everyone departing St. Thomas, even Americans, are now required by U.S. Immigration to show either a passport or a certified copy of a birth certificate accompanied by a photo ID - please don't forget these for the whole family! Please note that The Virgin Islands Smoke-Free Act has been passed by the U.S. Virgin Islands Legislature, which bans smoking less than 20 feet from many spaces, including enclosed public places, enclosed places of employment, outdoor service or waiting lines and outdoor bus stations and public transportation platforms. Smoking also is prohibited within 20 feet of any of those locations. Keep this in mind as you enjoy your stay in the U.S. Virgin Islands! Immigration - No passports required of U.S. Citizens (bring certified copy of birth certificate; add gov't photo ID for adults). Day and other trips to BVI require passport for re-entry; visas may be required from other destinations. Consult your national immigration office. Pre-stocking your villa with groceries is highly recommended, so that you can take your time finding the "vibe" on your first day in. Fine dining in an even finer restaurant? Let us share our suggestions and make the reservation for you. Special occasions and milestone event coordination assistance are also available. Caribbean Nanny Services, LLC - The ONLY Virgin Island independent, licensed and fully insured organization with a staff of Nannys that are recipients of USVI Health Cards, Early Childhood Development, CPR and First Aid training. “Pre-Arrival Shopping Service” - Pre-stock your villa before you arrive. Island and Villa Weddings: Please read our Island and Villa Wedding Guide and visit the St. Thomas Wedding Officiant page and www.blueskyceremony.com for information regarding getting married in the Virgin Islands. Professional chef services are available at your St. Thomas villa, for one or several meals during your stay. Menu selections span the gamut of preferences, with some creative fusions thrown in, to spice things up a bit! Dazzling and delectable dishes will amaze even the most jaded gourmand. Relax and let the professionals cater to your every taste desire with an array of entrees, sides and sublimely sweet finishes. For those special occasions and events, allow your villa chef to lay the foundation to a memorable gathering, from island weddings to birthdays, anniversaries and reunions. Catering, on-site preparation and meals ready-to-eat are available. Advance arrangements are highly recommended for this exclusive service. Order your Groceries Online - Pre-stock your villa before you arrive. Visit one of our many resorts for hair treatments and styling, massages, facials, wraps, manicures, pedicures or... have your bodyworks/massage or other spa services delivered to your St. Thomas villa! Enjoy facials, seaweed and aloe wraps, manicures, and pedicures. Prepare for your Virgin Islands wedding with a makeover or updo in the privacy of your villa by skilled aestheticians. Special treatments for groups, couples, brides, and grooms as well. Both male and female massage therapists on staff, but subject to availability. Advance reservations highly recommended. 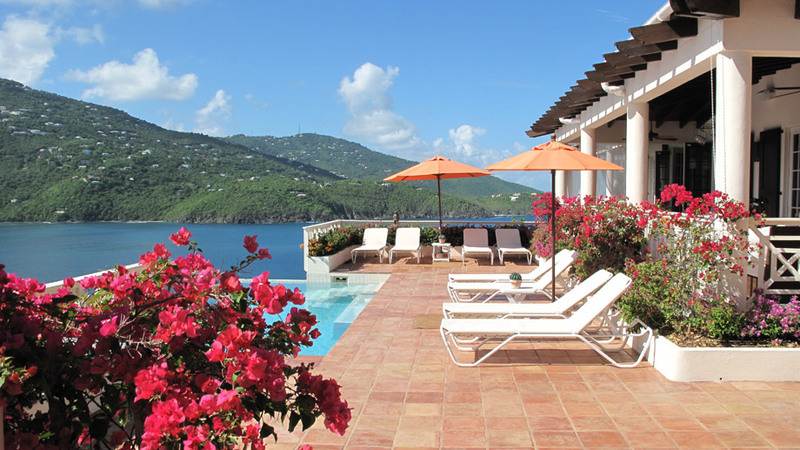 Enjoy the pleasure of an abundance of options for marine activities during your St. Thomas villa stay. The waters between St. Thomas and St. John, and then on to the British Virgin Islands including Jost Van Dyke, are liberally seasoned with key diving and snorkel sites such as Sprat Point, Supermarket, Cow and Calf and the Baths. Motor across the crystalline sea in a powerboat, or feel the majesty of commanding tradewinds on a sailing trip to islets and cays galore. From powerboat rentals and sportfishing expeditions, to kitesailing, get set for plenty of wet and wild action above and below... and it all starts on St. Thomas! St. Thomas and Virgin Islands bareboat rentals or crewed charters are available. If you will be traveling from the U.S. to the British Virgin Islands during your stay, please note that smoking in public spaces is banned according to a law passed by the Legislative Council there. This includes bars, restaurants, nightclubs, airports, offices and arenas, and within 50 feet of any public area. Keep this in mind as you enjoy your time in the British Virgin Islands! While not as briskly-paced as a major metropolis, St. Thomas has much to offer in the way of activities and attractions. You may choose to ride the whirlwind of available options, tuck yourself away in the idyllic splendor of your villa... or take in the best of both worlds. The world class Mahogany Run Golf Course, tennis, personal trainers and the sights and sounds of St. Thomas are yours for the picking. Whatever your choice, we are sure that you'll enjoy this most excellent U.S. Virgin Island to the utmost. Arts Alive at Tillet Gardens (Tutu, St. Thomas) consists of a series of al fresco concerts, the Pistarckle Theatre schedule, and arts and crafts festivals (including the now renowned post - Thanksgiving kickoff to the Christmas shopping season). BVI Spring Regatta - Since 1972; one of the Caribbean's premier annual racing events. Coral World Ocean Park and Butterfly Garden: (Smith Bay, St. Thomas) Get up close and personal to the beauty and magic of Caribbean marine life. Here you will experience what may be a once in a lifetime opportunity to touch a shark, hand feed a stingray or watch newborn seahorses learn to swim. In addition to many interactive exhibits, an array of water activities. Horseback Riding at Carolina Corral, St. John Trail rides on horses or donkeys from St. John's Carolina Corral near Coral Bay. Lessons and children's parties available. First-timers welcome; children over 4 years of age, please. Jazz in the Moonlight/St. John Blues Festival: The tiny isle of St. John comes alive with the sound of music for everyone as St. John photographer Steve Simonsen plays host. International Rolex Cup Regatta (American Yacht Harbor, St. Thomas) weekend in the U.S. Virgin Islands is a high point for many yachtsmen and yachtswomen from around the world. Known as the "Crown Jewel of the Caribbean" it represents an opportunity to shake off the winter dust in preparation for a hard summer's racing. Magens Bay (North side, St. Thomas) is noted by National Geographic as one of the 10 most beautiful beaches in the world! Under the aegis of the Magens Bay Authority, this beach offers full services, including restrooms and changing stalls, lifeguards on duty, managed taxi and food concessions, free entry for young children, elderly and physically challenged, and more features. World-class, white sandy beach with facilities for private gatherings make Magens Bay a longtime favorite for visitors and residents. Mahogany Run Golf Course (Mahogany Run, St. Thomas) is the only golf course on the island of St. Thomas. The public course is located approximately 20 minutes from the cruise ship docks in the town of Charlotte Amalie and only 15 minutes from the ferry dock at Red Hook. Paradise Point (Havensite, St. Thomas) - "Ride the View" - St. Thomas Skyride whisks you 700 ft. above the town of Charlotte Amalie. As one of the "must do" attractions in the Caribbean, the skyride carries 24 passengers every seven minutes along its 8 tower ascent of Flag Hill. Casual dining, live entertainment, and shopping. Paradise Jam (University of the Virgin Islands Athletic Complex, St. Thomas) is an annual, two-week tournament, broadcast live on national television, which gives NCAA Division I basketball teams a chance to compete early in the season. A production of Basketball Travelers, Inc.
Pistarckle Theatre's (Tutu, St. Thomas) mission is to provide quality professional theater, training and educational programming designed to enlighten and entertain. Each season, the theater presents four full-length plays as part of its subscription season. Reichhold Center for the Performing Arts (University of the Virgin Islands, St. Thomas) enriches the cultural and social life of the University of the Virgin Islands and its community with programs and performances drawn from across the globe that exemplify the best human artistic expression. St. John Festival celebrates both the Emancipation of 1848 and Independence Day (American). All islands and the world come together for the events and grand finale, the 4th of July Fireworks in Cruz Bay. St. Thomas Historical Trust has opened an office and mini museum at Royal Dane Mall in downtown Charlotte Amalie, on St. Thomas. Antique furniture, artifacts, art work, photographs, books and more are on display in the museum which is one flight up from the Philip Sturm studio. The mini museum is open from 10:00 a.m. to 4:00 p.m.
St. Thomas Excursions & Tours - Experience St. Thomas in a whole new way - book guided kayaking, bicycling, fishing, and walking tours & excursions during your stay. When booking online, enter "McLaughlin" into the "Apply Promo or Voucher" space to get a special discount! The Forum is a nonprofit organization dedicated to bringing world-class artists and events to St. Thomas that would not be commercially viable to produce here. The organization sponsors musicians, artists, speakers, theater, dancers, poets and films to challenge, educate, uplift and astonish. Virgin Islands Carnival is one of the top cultural celebrations in the world! On the heels of the Easter Holiday, weeks of pageantry, music and mas culminate in the ultimate showcase: the Adults' and Children's Parades during the "last lap". Virgin Islands National Park: The Virgin Islands National Park's hills, valleys and beaches are breath-taking. However, within its 7,000 plus acres on the island of St. John is the complex history of civilizations - both free and enslaved - dating back more nearly a thousand years, all who utilized the land and the sea for survival.